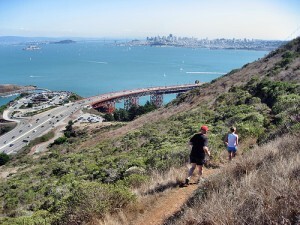 I ran across the Golden Gate Bridge and onto the lovely single-track trails of the Marin Headlands. My body was tired. My intuition told me to run no faster than a jog. The most harmonious feelings came at about 60% of maximum heart rate – barely a crawl. For as long as I held that pace, I felt fine. But I was too weary to heed the heart’s guidance, and I ended up going too far and fast. I ran the final miles without any semblance of smooth form or inner enjoyment. Driving home, I questioned why my training has become so chaotic. I’ve tried to follow the intuitive guidance of the heart, but for months now, I’ve been unable to honor and follow its messages. The proof is my many failures: bad runs, pointless runs, runs without joy or harmony. For reasons I don’t understand, I’ve failed to find my heart’s innermost intuitive core. Driving on the freeway, I realized that what I need is order and structure. If I were sufficiently skilled at listening to the heart’s guidance, I wouldn’t need a training plan. I could don shorts and start running, confident that intuition would guide me. But I’m not that runner – yet. I need order. But what kind of order? Perhaps the kind that allowed me to run for 18 months without injury or missing a single day, ten years ago. I followed a simple training plan that I called the “Inch-Up Theory.” By adding mileage in tiny increments, I built up to running 45 and 60 miles on alternate weeks. Two days after the run across the Bridge, I had a run that nicely blended order and inspiration. I took time during the warmup to ask for guidance. And I vowed to follow whatever guidance might come, even if it meant running slowly and/or not as far. I made a stern vow to set my personal desires firmly aside. Again and again, I drew my attention away from distracting thoughts, to a gentle focus at the point between the eyebrows, where mental focus and positive attitudes are localized in the brain..
After 40 minutes I felt very good. When I tried to bump the pace, my heart felt subtly abused. But when I resumed cruising in the day’s natural harmony zone, I felt wonderful. It was an enjoyable run. I ran for an hour and 25 minutes, a half-hour longer than my normal recovery run. Immediately after, and for the rest of the day, I felt fresh, relaxed, and alert – the reward for following the body’s wisdom, expressed through the intuitive feelings of the heart.